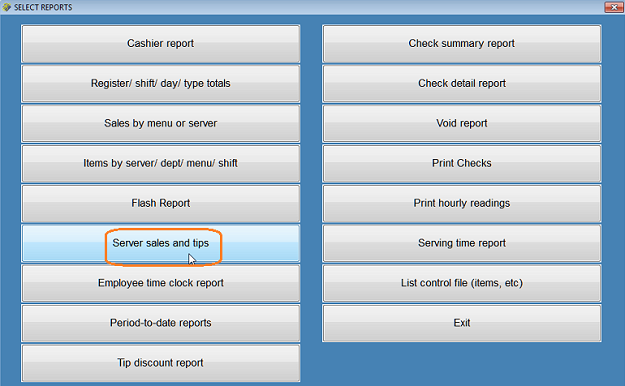 From the Print Reports menu select Server sales and tips. Enter the relative information (date, server ID, etc.) at the prompts. 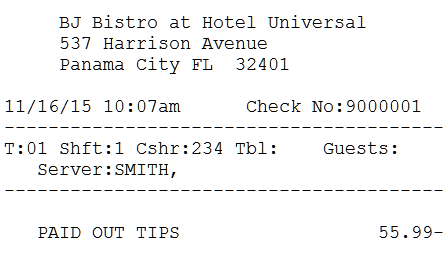 This shows you the dollar amount of tips for the server selected. 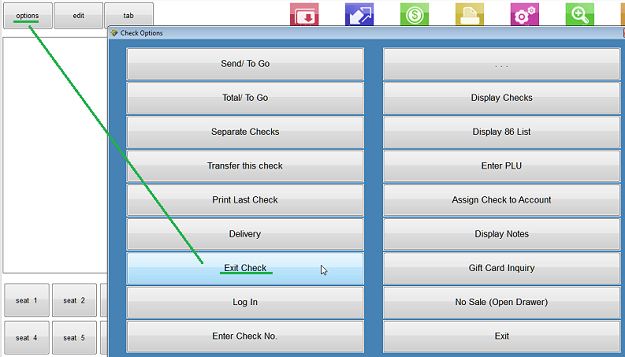 Then go to Main Menu or Options>Exit Check or Exit (depending on your configuration) and select Paid-out. 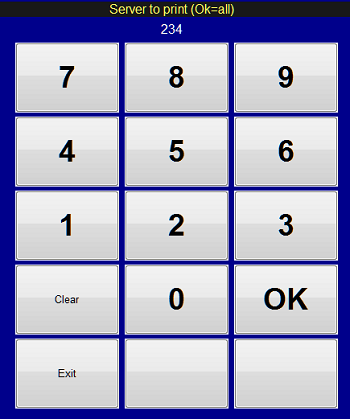 Enter the relative information at the prompts. Note that the server and the cashier may or may not be the same person. 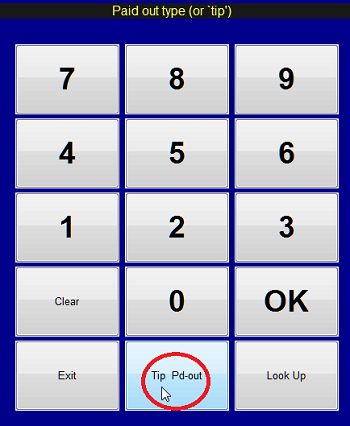 You must have a POS payment code P/OT for paid-out tips and P/O* (such as P/OV) for other paid-out types. You must have a POS payment code P/O* in order to properly process paid-outs. Note that it is the cap letter O (for "Out") and not zero. The Tips paid out code must be P/OT with Description "PAID OUT TIPS". Examples of other paid-outs include P/OV and P/O2. If you are using Execu/Suite PMS, then you must enter a valid Hotel payment code. 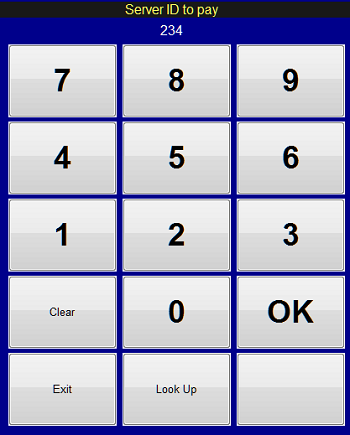 From the Main Menu or Supervisor Menu select Print Reports. Select Server sales and tips. 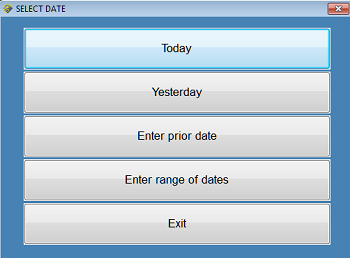 Select Today or other date option. Enter the server ID to print. Select the printer or select Screen. Printers are defined in Printer Setup in POS Administrator. Below is the server sales and tips report. 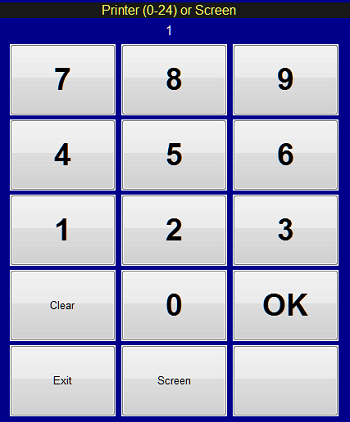 You also may print Register Totals or Cashier Report. See POS Reports . 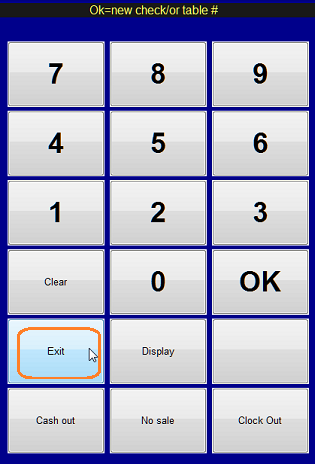 Go to Main Menu or Options>Exit Check or Exit (depending on your configuration) and select Paid-out. Enter the Cashier ID and touch/click OK. Remember, the Cashier and Server may or may not be the same person (ID number). 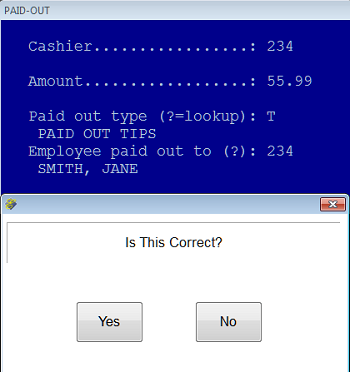 Select Tip pd-out and touch/click OK or select Look Up for a different type of paid-out. Enter the Server ID to pay and touch/click OK. 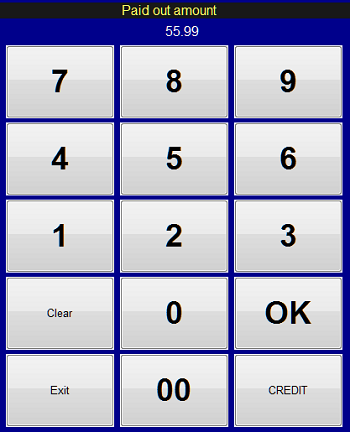 Enter the Paid out amount and touch/click OK. If everything is OK select Yes. If not, select No to start over. A paid-out slip will print. To credit a paid-out (return cash to the drawer or correct an error) do the above except select Credit before entering the amount. 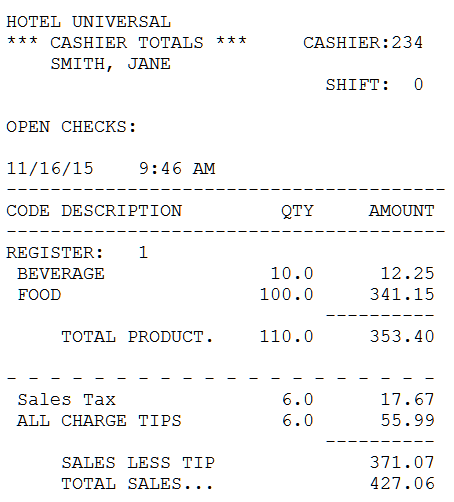 Below is the server sales & tips report prior to the paid-out. 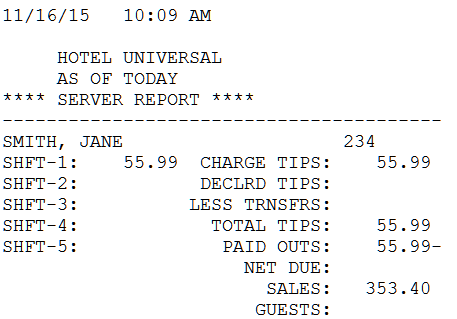 Below is the server sales & tips report after to the paid-out. Below is the POS master folio showing the paid-out. Note the two-sided transaction (debit to cash and credit to tips). 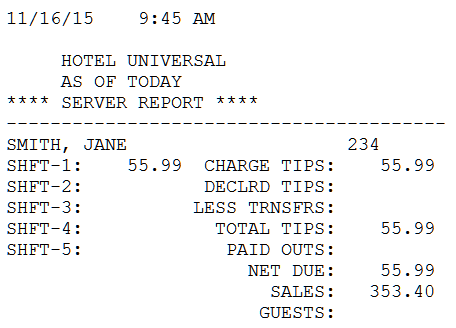 Below are the lines from the Hotel Guest Charge Journal and Payment Journal. 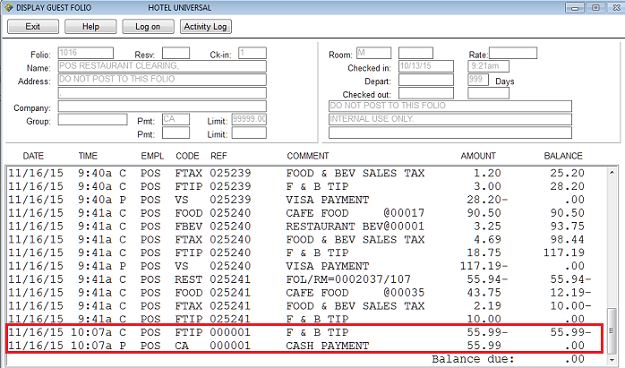 If your "Hotel payment code" in the paid-out POS setup is not CA then it will debit the code that you designated.